You will agree that clarity of responsibility, about how they support your objectives, is necessary. 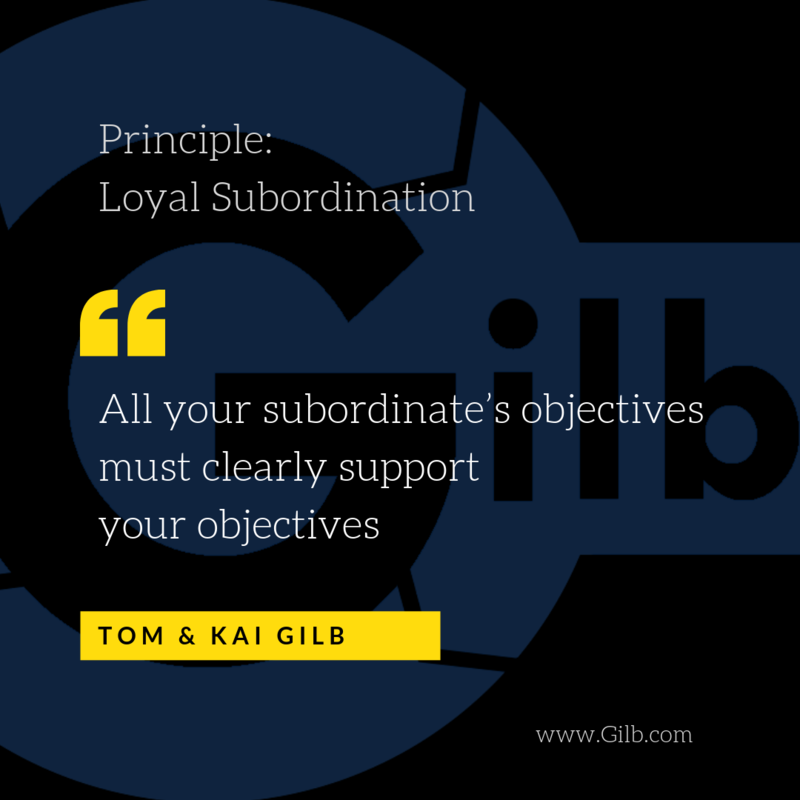 If they do not know exactly what your objectives are, they cannot support you very effectively. If you change, even a few details of your objectives: they should be informed so that they can change their support correspondingly. If you choose to hide your objectives or to formulate them unclearly: then you are responsible for your support team’s lack of ability to serve your interests. If you choose to tell them (‘dictate') ‘what’ to do (the means to your objective), rather than your smarter option, of simply telling them ‘how well to do it’ (in terms of your objectives); you bear responsibility for that choice, so be conscious of it. Normally, let them figure out ’how’! They should agree, or explicitly disagree, that they will support reaching some of your goals, to some degree. They should be able to show a credible (numeric, experiential, guaranteed) relationship between their activity and plans, and their hope of helping you reach your strategic objectives. They should be able to show measurable numeric progress, at least using leading indicators, that their plans are working in practice. Early and frequently. They should expect credibility and rewards, based, not on what they have done – with good intent – but what they have delivered of your values. Outside contractors should be prepared to put their money where their mouth is, and base payment on your results, not just their effort. Scale: Average number of New Product Variations per Lab Employee, per Year. Goal [in 3 years] 5 <- Estimated by Jens Jensen. Value Decision-Impact-Estimate: Planned Product Volume [G2020]: by 50% <- Est. JJ. Expressing the planned improvement towards the Goal contribution is a means of expressing the assumed relationship between two levels of objectives. It is ‘Value Decision,’ without the Table format. 1. 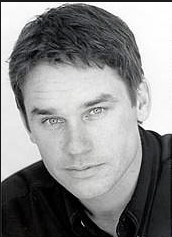 "When selecting someone, they select for talent ... not simply experience, intelligence or determination." 2. "When setting expectations, they define the right outcomes ... not the right steps." 3. "When motivating someone, they focus on strengths ... not on weaknesses." What are we expecting, of results at the level above us, if we achieve our goals? Why haven’t we written that claim explicitly? Have we documented who made the claim? Have we documented who is ‘value result responsible’ for getting to our Goal there? directly show an estimated value impact relationship to your specific numeric value objectives. be prepared to adjust when your objectives are adjusted. be evaluated on cost-effectiveness and timeliness in helping you reach your objectives. Why? - So we know what to expect, and who is responsible. What do you do to 'even more' clearly express your objectives to your support team? Please share it with us? Do you pay or reward your support team on their ability to support you in achieving your objectives? How? 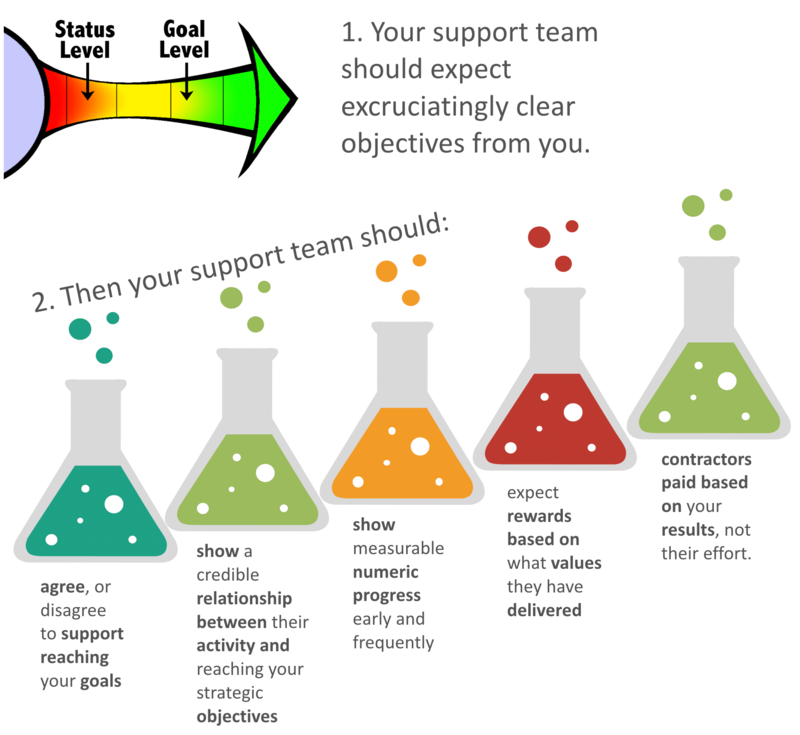 Do you pay your support team based on activity, not delivering results? Why? And if you found this article useful, please share it with your professional friends.